...and now for something totally different! Here's a blaster that I've been considering for a while now, and today I went for it! It's a multi-sport mashup from Upper Deck called Goodwin Champions. Hockey is definitely represented in this product, but is basketball, baseball, football, and assorted other sports... and even non-sports too. It should be a fun and unique break. Let's check it out! This will be my first time ever opening up this product. When it came out I was very temped to purchase a box to review, but I decided not to as I was short on funds at the time. But I'm very happy to have a blaster to check out today. Goodwin Champions is a product much like UD Champs Hockey. The base cards come on non-glossy card stock, mini cards are a big feature of the set, and there's a huge amount of variety. 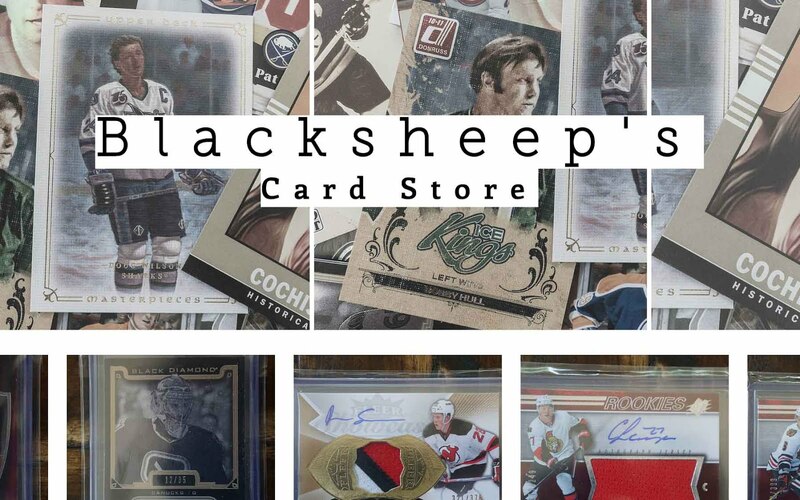 I think it's very intriguing that though I'm mostly looking for the hockey related cards, there is a chance at a Michael Jordan (which I'd ABSOLUTELY LOVE TO HAVE), Tiger Woods, or other non-hockey autograph. Also to be found are memorabilia cards and military machine cards. I'm not sure why Upper Deck decided to do a special insertion of military vehicles in the product... but they did! That's pretty odd to me. But it's an odd product... so it makes sense? I'm not going to try and wrap my head around that one... let's check out this blaster! Besides the blaster of Goodwin Champions, I also purchased 4 lose packs of 09/10 Upper Deck Series 1 Hockey on sale for $1.59 each. WOW, these packs were great for the price! I was pleasantly surprised to pull out 2 inserts and 2 Young Guns in the lose pack mini break. The two cards that stood out to me the most were a Sidney Crosby Season Highlight card and an Antti Niemi Young Gun. It was a very satisfying little rip! Man, I hope to find some more of these loosies next time at Target! They actually had a bunch of 08/09 UD2 lose packs too... but I don't think there's much to pull out of those. As for the Goodwin blaster, it was also a fun break. I may actually consider getting another box one of these days. The cards are just plain cool! Because it's mashup product, UD had to only choose the biggest names... and I feel like I pulled some great names out. I didn't hit any autographs or memorabilia cards, but I did get the 5 stated mini cards. The best of the minis was Wendel Clark. The picture on the card is perfect for this tough as nails player - he looks like he just participated in a scrap. One of my other minis was a green bordered Lady Luck back. I'm thinking this one is more short printed than the others. I like this one too as it shows former NFLer Brian Bosworth doing some martial arts. The strangest card I pulled was definitely the Military Machines card. I'm fine with military things, but it just felt a bit out of place here. The card itself was odd as it was the only card featuring full-glossy stock. It reminded me of the glossy inserts within O-Pee-Chee a bit... with military machines instead of athletes, of course. I just had to include Crosby here. I was debating between him and The Great One, but I went with The Kid because he's been following me around in my breaks the past few weeks. And even in this break I pulled out multiples of number 87, so I figured it had to be him. 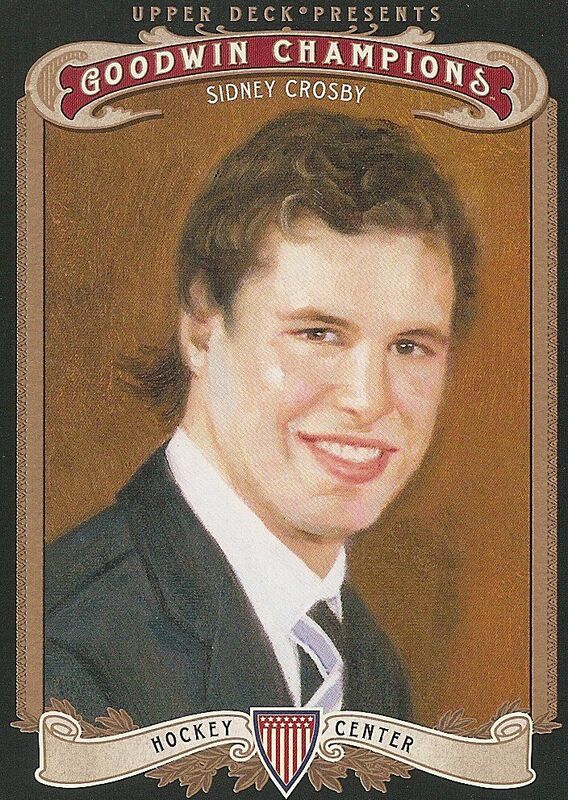 This is a very different card of Crosby though, he looks pretty young in this rendition - a very unique picture from a very unique set. Back in the late 80's and on into the 90's I was a HUGE basketball fan. 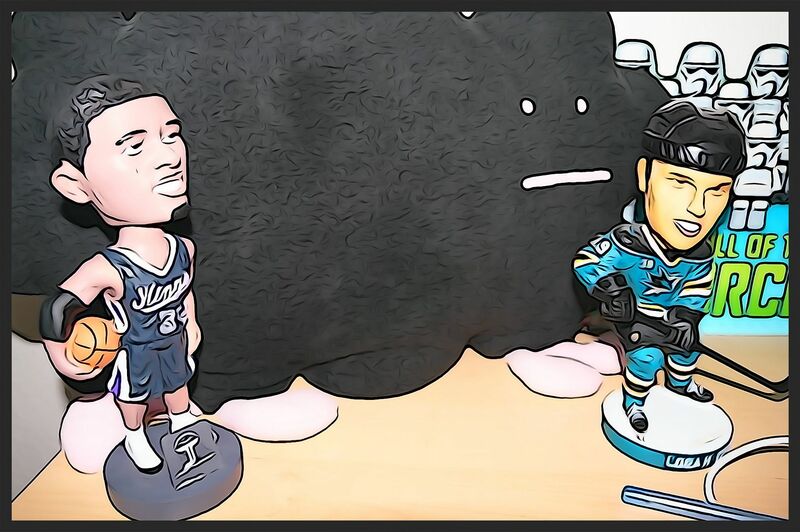 I chose to follow hockey more closely as the NBA has totally lost my interest. I think it's because there's a lack of players like MJ. He was an amazing basketball player and (besides the gambling habit) presented a great role-model image for the younger generation. 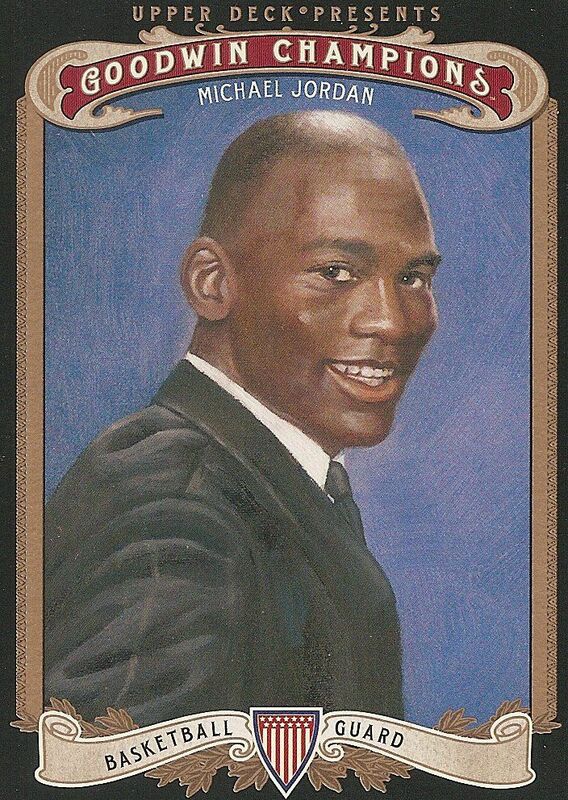 I would love to add a Jordan rookie or auto to my collection one of these days... but today I'll have to settle for this base card of his. How can I say no to THE BLACK WIDOW? At first I thought I had pulled a WWE card or something... but then I noticed the 'Professional Eater' at the bottom and instantly knew who I had. I've seen this girl eat a ton of hot dogs in eating competitions. She kicks @$$ in so many ways... and look at how small and skinny she is! 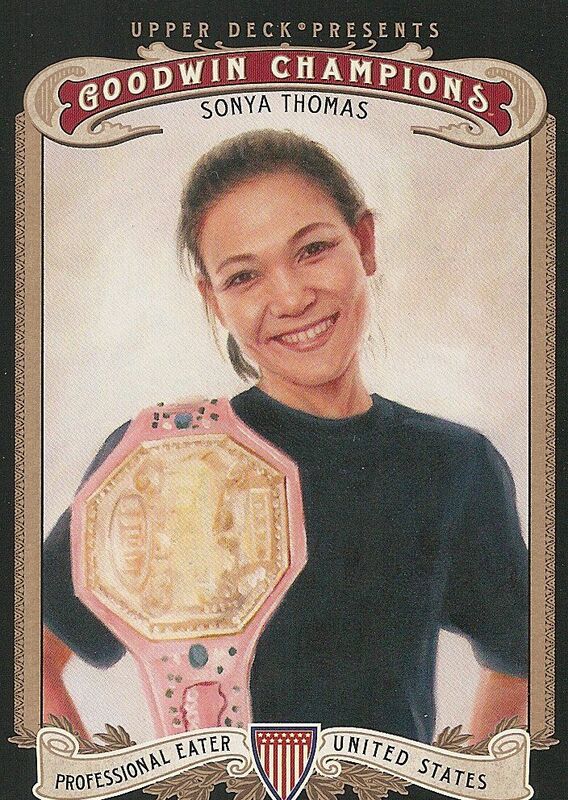 This is a cool card for sure, and my favorite of the break. At $20, Goodwin is an 'ok' break. The packs were really enjoyable to open, but in terms of value, only blasters with hits in them would make it worthwhile. The mini cards are unique, but I wouldn't say they hold the same allure as a jersey or auto. I'm sure that there are collectors out there who love the mini cards - and that's awesome - but for me, they are cards I could live without. I wish the blaster was less than $20. 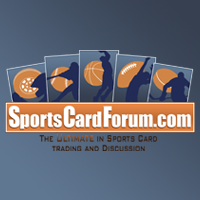 A quick check at dacardworld.com shows that last year's blasters can be found for less than $13. I think that is something I would definitely go for - that price is much better than the suggested $19.99 it says on the box. I'll have to pick one of those up the next time I make an order (which will be in a while because I just put in a pretty significant retail order)! 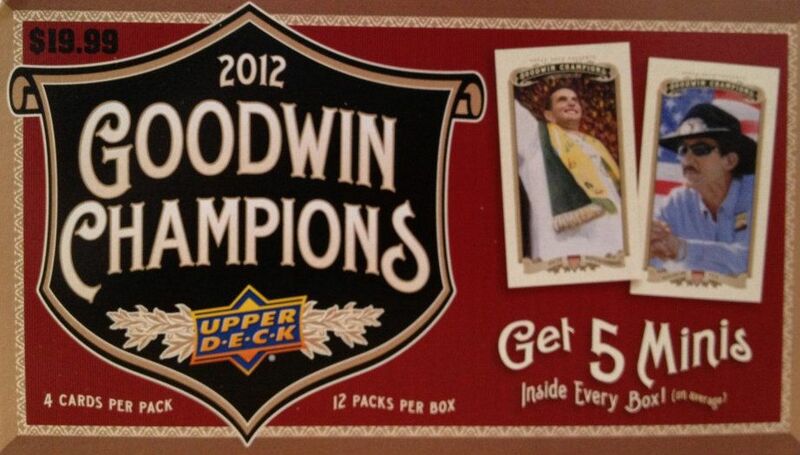 Let me know what you thought of my 2012 Goodwin Champions blaster box down in the comments below. Have you ever gotten anything good from one of these? I'd love to know! I watched someone bust a box of this product... a retail for $100. He pulled a Michael Jordan jersey and a dual auto of those two track twins. But I had a feeling he wasn't impressed and wanted more. I think it's a cool product. I haveent opened it myself, but it's pretty unique. Nice stuff.